Grocery shopping just got more practical. 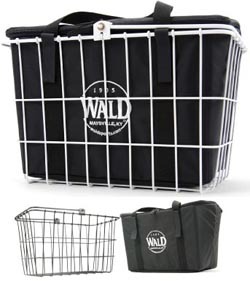 With Wald's New Insulated Basket Bag no more worries about items "loosing their cool" due to hot weather. Just unzip the bag, place your grocery items inside and zip the bag tight. Then ride home and fill up the fridge. In addition, when riding over to the local restaurant for take-out, the Wald Insulated Basket Bag will keep your dinner nice and toasty for the short ride home. "The Wald Insulated Basket Bag is designed to increase the functionality of our traditional wire bicycle baskets," says Jason Kazee, Wald's Outside Sales and Marketing Manager. "By creating this product in partnership with Inertia Designs, we are happy to offer another high quality, American made product that can be used in several Wald baskets. The basket bag fits perfectly inside Wald 133, 135, 198GB, 585, and 3133 baskets." "The timing of Lexco's open house in April allowed us to get the new bag in front of dealers to gauge interest and feedback," says Kazee. "Many dealers thought the bag would make a great pet carrier and others thought it would serve as a good lunch tote. It was also a wonderful experience just to talk face-to-face with dealers and hear stories about their personal experiences with Wald." Says Karen Peterson of Lexco: "With more and more people using their bicycles for transportation, they are looking for secure ways to carry a variety of items. The Wald Insulated Bike Bag allows them to do just that with a little more piece of mind than with just an open basket. And for dealers, the Wald Insulated Bike Bag is an add-on item that is an easy sell." The full line of Wald baskets and accessories can be found in Lexco's free 2008 Catalog. For details, call Lexco toll-free at (800) 626-6556.